Admittedly, there have been only eight Chinese Grand Prix so far, but there have been some gems. The Badgerometer delves into the archives to give you five of the best! Rubens Barrichello won the inaugural event on Chinese soil, but 12 months later it would be the last round of the championship, which by then had already been decided two rounds earlier in Brazil. Fernando Alonso was the victor in the race and delivered pole position the day before. It was a demonstration of what the Spaniard had achieved all season – calm, assured driving that was blisteringly fast. Symbolically, Kimi Raikkonen ended up a distant second, which is exactly where the Finn would end up in the race for the title that season. Kimi would secure the fastest lap though, equalling the record of 10 in one year. Other notable drives were Christien Klien (Red Bull) and Felipe Massa (Sauber, remember? ), moving from 14th and 11th on the grid to 5th and 6th respectively, while Ralf Schumacher was third for Toyota. Michael Schumacher, who finished a season without a Driver’s Title for the first time since 1999, collided with the Minardi of Christian Albers on the warm-up lap and spun out after 20 laps. A sign of things to come? Lewis Hamilton’s dazzling debut season still brings smiles to everyone in the Sett, but it was in China that year where the possibility of a Driver’s Title first time out started to slip away. Heading into the race, the young British charger was 12 points clear in the standings, so would lead coming out of Shanghai no matter what. When he stuck his McLaren on pole position, despite rival Kimi Raikkonen’s Ferrari being the fastest car in every session bar Q3, it looked like Hamilton was going to seal it in style. But, thanks to wet weather brought in by Typhoon Krosa, fate would have other ideas. Although they were leading the race, McLaren decided to stick with their regular strategy, despite Hamilton’s intermediates being worn badly. Raikkonen passed him for the lead on lap 31, before the Brit finally stopped. It would prove to be disastrous. Hamilton retired on the spot, and Raikkonen went on to win, cutting the 17-point gap to 7, with one race to go. We all know the rest, but if Lewis had been a bit less conservative, the history books might read completely differently. Fast forward 12 months later, and Lewis Hamilton was in a title fight once more, this time with the other Ferrari of Brazilian Felipe Massa. The press would draw comparisons to 2007 – Hamilton was the points leader, had placed it on pole, and had everything to lose. Only, this time, everything clicked for Hamilton. 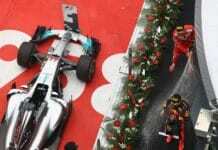 It was a straightforward lights to flag win, finishing 14 seconds ahead of closest rival Massa, who passed team-mate Raikkonen in the closing laps to maximise points. Hamilton had a 7 point advantage going into the season finale in Brazil – and we all know how that turned out! On the track, it seemed quiet, but in essence, Lewis had made a very loud statement indeed in terms of whether he was worthy or not. You’d be confused in thinking it was Malaysia, the way the rain came two years ago in Shanghai. But, like it always transpires, it became a showcase of wet-weather driving from a one Jenson Button. The Red Bull duo of Sebastian Vettel and Mark Webber locked out the front row – as was becoming the standard fare – but the Ferrari of Fernando Alonso got the jump on everyone to lead into the first corner. It transpired that the Spaniard had also jumped the start and had his wrist slapped. The rain stayed light, but constant, so many drivers opted for inters to gain an advantage, but Nico Rosberg, Button and the Renaults of Robert Kubica and Vitaly Petrov stayed out to risk it on the slicks. With the rain then easing off, these four had a buffer between them and the recovering pack. This was soon eliminated thanks to the safety car, which prompted many to pit. The Ferraris of Alonso and Felips Massa raced each other in, while Lewis Hamilton and Vettel raced each other in the pit lane itself. Button ate into Rosberg’s lead, and passed him, while Hamilton went on a banzai run to move from 7th to also get by Rosberg for 2nd place. The young German hung on for third to secure Mercedes’ second consecutive podium since their return, while McLaren got their first 1-2 since Italy 2007. Button cemented his reputation for being excellent in the wet, adding this win to the Australian race of the same season, in exactly the same conditions. Pirelli tyres and some barnstorming driving made last year’s race not only the most exciting China has ever produced, but also the most exhilarating of 2011. Some might even dare to say that it was the most exciting race of the modern era. The race had it’s drama before it even began. Lewis Hamilton’s McLaren suffered a fuel leak in the garage, and the team worked a minor miracle to get it fixed by the warm up lap deadline. It really was a matter of seconds. This only added to the spectacle when the Briton triumphed in the race. At the start, Jenson Button got the jump on Lewis and pole man Vettel to lead, and this was the order going into the first round of stops. Jenson, however, had a huge case of brainfade, parking his car in the Red Bull pit box. Hamilton then pitted, but surprise package Nico Rosberg grabbed the lead for a period, with the McLaren duo battling it out behind. This came to a head, with Martin Whitmarsh wincing a little. With Hamilton on three-stops and Vettel on two, in came down to those two in the closing stages. With his fresher tyres, and buoyed by the confidence of his earlier overtakes, Lewis came out on top with only a few laps to go. Behind them, Mark Webber charged through the field from a poor 18th in qualifying to pass Button on the very last lap for 3rd place, in a perfect model of how to use the Pirellis when further down the field.